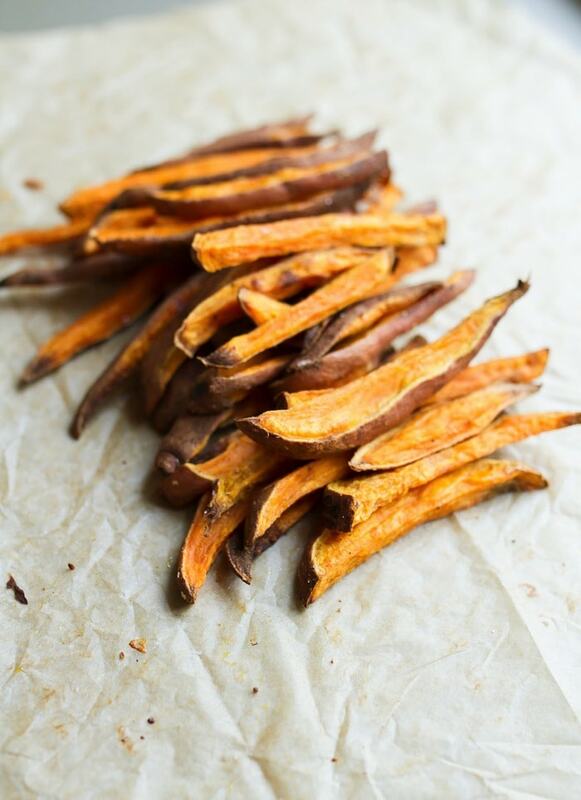 Satisfy your craving for fries with these healthy baked sweet potato fries. They’re crispy, delicious and perfect for serving alongside a burger or sandwich. I don’t know about you, but I’m a potato girl. When it comes to carbs I’ll take potatoes over bread any day and I’ll eat them just about any way you cook them. I grew up eating the not-so-healthy type of potatoes like fast food fries, chips and my mom’s fried potatoes. 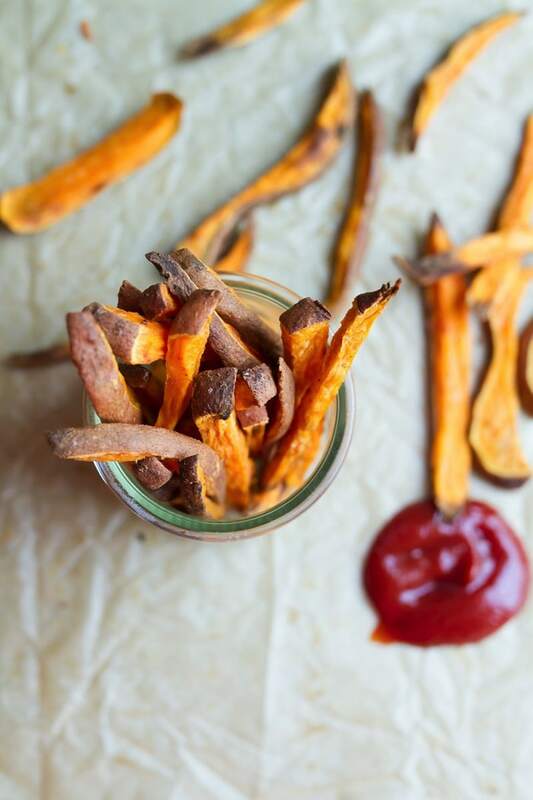 That said, I rarely have a craving for the fried version because I make baked sweet potato fries (and sweet potato croutons) at home all the time and they’re just as tasty! Oh and I should note that it’s crazy easy to eat a full potato’s worth of these fries by yourself so double the recipe if you’re making these for a few people. Just be sure to use multiple baking sheets so that your fries aren’t too close together. They need a little room or else they’ll steam and never crisp up. 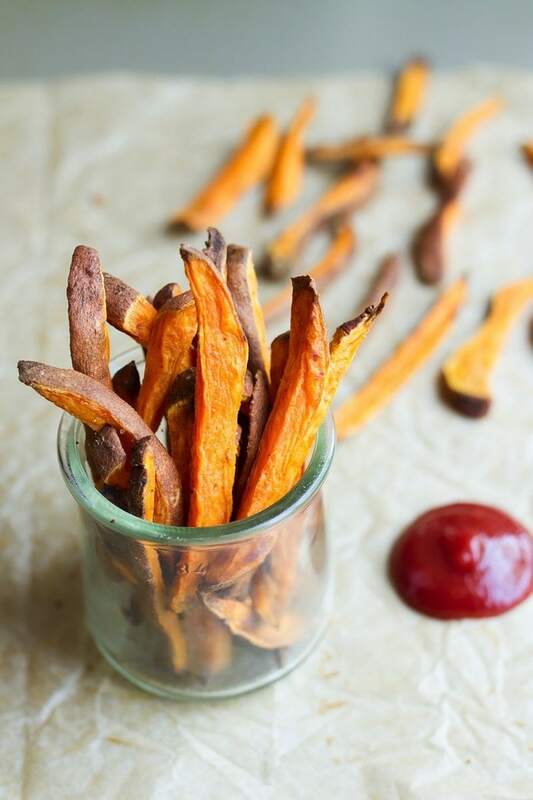 Healthy baked sweet potato fries that are crispy, delicious and the perfect side to serve with a burger. 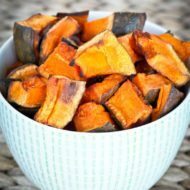 Preheat oven to 400°F, place sweet potato slices into a large bowl, top with the remaining ingredients and stir to coat evenly (I typically use my hands). 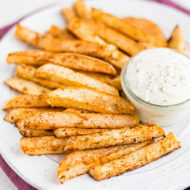 Spread the fries onto a baking stone or a baking sheet lined with parchment paper making sure the fries aren’t crowded. They need space or else they will start to steam and get soft rather than crispy. Bake for 15-20 minutes, take them out of the oven and flip, then bake for another 15-20 minutes. Keep an eye on them the last 5-10 minutes as some of the smaller pieces might start to burn. I have been hearing a lot about this weight lifting for women book, I think I may need to pick it up. I LOVE weight lifting, but I am thinking I should be researching it more to get the full effects. need to pick up shape magazine ASAP! oh man i just love this post.. has so many of my favs… cherries, chocolate, protein, sweet taters, beets, salmon OH MY! but i totally thought the wasabi peas were mouldy.. like the white stuff around them.. glad theyre just normal.. the ones ive seen are pretty wimpy tho and really small.. but i LOVE WASABI like crazy! I love sweet potato fries!! I feel stronger and more energized when I eat more protein (and less carbs/bread). The reusable bags are a great idea. I keep at least two in my car, but can always use more!! Going to head over to that website now. Omg 🙂 I don’t know where to begin, everything looks delicious and so so fresh!! I feel like a little extra protein never hurt, and I love that you’re incorporating WASABI PEAS while doing so! Those are my absolute favoriteeee. Especially with some dark chocolate chips, nuts, dried fruit, etc –the salty/sweet trail mix combo is killer! Promise. And that choco cherry bomb is my new thing! I’ve been adding a little extra cocoa powder/stevia & xanthum gum to the mix and it seriously tastes like a big bowl of chocolate fro yo to me! Love. it. I have actually never had wasabi peas or edamame. I really need to get some next time at TJs. And I totally agree – 2% tastes so much better! 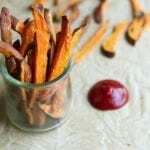 sweet potato fries are seriously the best, the sweet with the savory/spicy combo is fabulous! these bags look great too! Those bags are adorable, I’ll have to check them out to buy 🙂 I think black bean burgers and sweet potato fries are among my favorite foods! That salad is gorgeous–so many jewel tones! Man, I wish I were still in RDU so we could have a meet-up. Someday, I hope! Wow! All your food yesterday is on my favorites list 🙂 I’ve been snackin’ on the wasabi peas that have been in my cupboard for weeks. I just found out they’re gluten free, despite the “glutinous flour” in the ingredient list. Yeah, NROL4W is a great program! You go girl! My hubby got me a Chico bag last year and I love it!!! The baggers at stores are always amazed because of how small it compacts and how well it stretches. Have a great day Miss Brittany! Love wasabi peas – I’m going to have to try the edamame!! Sweet potato fries are one of my favorite things!!!! Salad looks gorgeous. I’m definitely adding cumin to my sweet potato fries next time I make them. Sounds like a delicious addition to an already tasty meal. I have the same issue with leaving a few bags in the car + then not replacing them when I go to the grocery store. I literally feel guilty when I go in the store without them, so I buy more. I must half like 100 of those freakin bags! I love the idea of using coconut oil for the fries – mmm! Rolling them in ground flax is super yum too. cherries and cherry juice has been shown to be an amazing recovery drink post workout too!!! i love it!! oh yeah, you want to build muscle gotta up that protein! Ok i thinkits time for me to try the 2% i dont know why I never have, but i have heard from so many that it tastes amaazing and its still lower in fat, so yes i gotta try it! I saw meghanns artical too! Your daily eats look wonderful! I’m traveling now, and I’m missing being able to prep my own healthy food. I am also trying to eat more protein, and greek yogurt is one of my favorite sources! YUUUM – fabulous eats as always, Brittany! Thanks for the lovely recipe – can´t wait to try it on my own! The kale chips from the last post look freaking amazing! I really love wasabi peas….and could eat them all day long! I think i shall make some sweet tatter fries tonight! Wasabi peas = happy mouth. Enjoy NC – I miss it already! I have never made sweet potato fries for my guys before, but I think I need to. That burger looks so good…and with those fries…YUM! I love the idea of the reusable produce bags…I am going now to enter! Thanks for sharing and have a safe trip! HI BIRITANNY GONNA MAKE THOSE SWEETPOTATOE FRIES NEVER HAD THEM B4? BUT LETME ASK U SOMETHIN? SHOULD I GET SWEET POTATOES OR YAMS? I DONT KNOW THE PIC SORTA LOOK OTANGE LIKE YAMS? PLEASE LET ME KNOW GOING TO THE STORE 2DAY TO PURCHASE? THANKS LOAD TONS MILLIONS!!!!!!!!! Oooh yum!! I just made those Crispy Sweet Potato Fries. Yum!!! What a cute apple bag! I’m definitely going to look it up! Hands down one of my favorite foods. 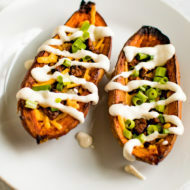 You can’t go wrong with baked sweet potato fries! They are the perfect side dish to any meal. 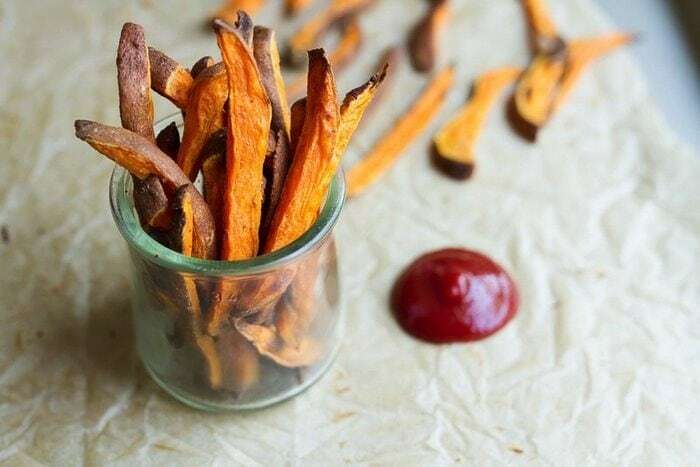 I make sweet potato fries just like this, all the time! They are such a huge favorite and I could really make a meal out of them! Those look so frekaing yummy! 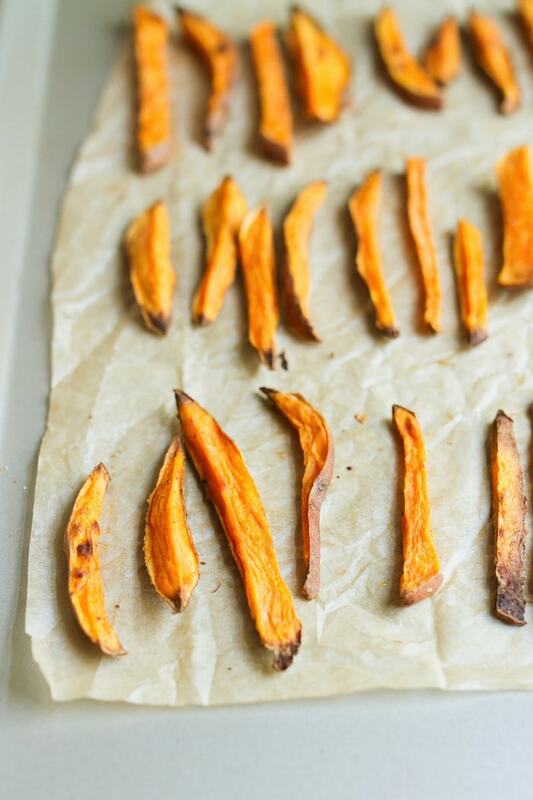 I love sweet potato chips and have been experimenting with oil-free cooking recently… they work really well without oil, too! I like to add a little nutmeg and smoked paprika to mine. I love sweet potato fries! I need to make sweet potato fries more often! These look and sound amazing. I love the mixture of spices too! We can’t get enough sweet potatoes right now! I love them! Can never go wrong with sweet tater fries… mmm. 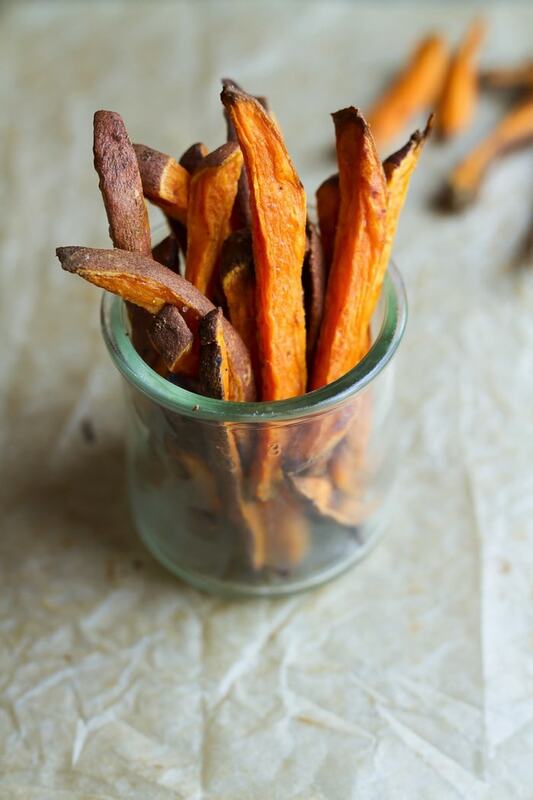 Sweet potato fries are a favorite for me! These look delicious! I would LOVE a side of these with your hearts of palm BBQ sandwich!! Those have been on my to-try list this summer. Sweet potatoes cooked any way are my thing! I absolutely love sweet potato fries! I’ll be sure to try out your recipe, hopefully to change the traditional flavor of mine. I just made these fries and they are so good!! I love how simple this recipe is, and that is uses common household ingredients! Yay! This recipe is one of my favorites. So glad you enjoyed it, Natalie.